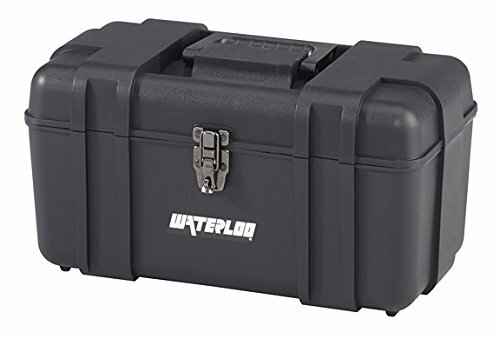 The Waterloo 17-inch wide plastic tool box has the durable construction needed by professionals. The sturdy construction is built with reinforced walls that are among the thickest in the industry. Don't be afraid to pack this box full of tools. It can be transported with a sturdy top handle that folds flat against the lid. This tool box is proudly made in Sedalia, Missouri with us and global components. A full-width removable tote tray keeps small or frequently-used tools organized and easy to access inside the box. The lid is secured with a best-in-class full-width metal hinge pin. A large metal latch features a padlock eye that can secure your tools. (Padlocks are not included.) this tool box is 17”w x 10.5”D x 9.75”H with a storage capacity of 1,415 cubic inches. Your purchase is backed by a 1-year limited manufacturer’s warranty.